Dedicated 3D and 2D graphics acceleration – dual threaded unified shader (Vivante GC1000 and GC300) with support for OpenGL ES 1.1/2.0 and DirectFB. 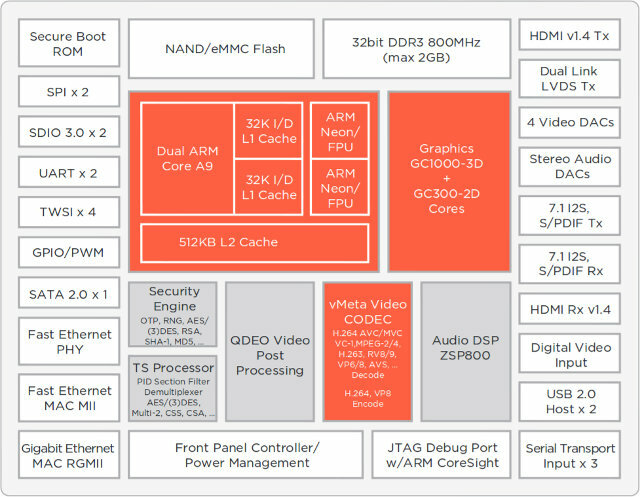 vMeta Video Codec – Decoding: H.264, VC-1, MPEG2, AVS, VP8 and several other formats. Real-time encoding: H.264, VP8 to allow the platform to function as a multi-screen source device. Audio – Support for HE-AACv2, Dolby HD, DTS-HD, SRS and other high-end audio formats. Hybrid architecture – Multiple TS inputs supports PayTV Operators STB requiring both broadcast (DVB-T,C,S) and IP content deployment. 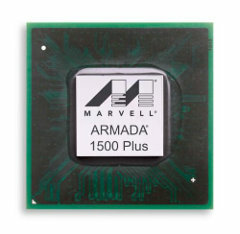 Marvell ARMADA 1500 Plus appears to be very similar to the older Marvel ARMADA 1500, except the company switch to ARM Cortex A9 cores instead of using its own ARMv7 implementation, it may have added Vivante GC300 for 2D graphics (TBC), fast Ethernet has been upgraded to Gigabit Ethernet, the SATA version has apparently been downgraded to SATA 2.0, and HDMI got an upgraded to v1.4a (vs 1.4). The rest of the SoC appears to be more or less the same according to the block diagrams.